The Baikal rift zone is overlain by some 7500 m of sediment (e.g., Hutchinson et al, 1992), and although past glaciations have had dramatic effects on the Lake Baikal Region, that is, its hydrology, sedimentology, ecosystem, and shore line (Grosswald and Kuhle, 1994), the lake bottom itself has never been directly affected by glaciation. Lake Baikal therefore contains a potential uninterrupted sedimentary archive possibly going back more than 20 million years, which is unusual in continental settings. Baikal's mid-latitude location in the centre of Asia also makes it sensitive to changes in insolation patterns caused by orbital forcing (Peck et al., 1994). These factors, together with the lake's close proximity to the boundaries of the Siberian high and the Asian monsoon weather systems, make Baikal important for paleoclimate research (e.g., Colman et al., 1995) and as such it is a key site in the Pole-Equator-Pole (PEP II) transect in the PAGES programme (Dodson and Lui, 1995). Paleoclimate research on Baikal is based primarily on results from the Baikal Drilling Programme (BDP), which consists of a consortium of Russian, American, German, and Japanese scientists. The programme is relatively new, and our knowledge of paleoclimates in the Baikal region is still growing. The longest core retrieved so far (600 m) is from the shallow waters of the Academician Ridge, and spans an estimated 12 million years (Kashiwaya et al., 2001). Research published to date has been mainly concerned with fluctuations in proxies of biological production in the lake and wind-blown soils on to the lake. For example, Granina et al. (1993) used biogenic silica in the sediment record as an indicator of glacial cycles. During interglacial periods, such as the present, diatoms are major primary producers in the lake, accounting for c. 98 per cent of all sedimentary silica (Granina et al., 1992). However, during glacial periods, diatom production decreases resulting in decreased sedimentary concentrations (Colman etal., 1995; Julius et al., 1997). Glacial periods are also characterized by high magnetic susceptibility values, which reflect increased input of wind-blown loess, as climates in Asia became colder, drier, and windier (Velichko et al., 1984). All the isotopic stages identified in marine records over the last 800 000 years (Ka) are present in the Baikal record, as determined by biogenic silica analysis (Figure 17.7) (Williams et al., 1997). Furthermore, a good correlation between glacial-interglacial cycles in Baikal and the SPECMAC record (the standard oceanic oxygen isotope record of global ice volume) exists from biogenic and mineral magnetic analyses (Peck et al., 1994) and from diatom analysis (Grachev et al., 1998). Colman et al. (1995) determined insolation patterns from Baikal sediments at 19, 23, and 41 Ka obliquity cycles (which are also present in marine systems), as well as a nonlinear 100 Ka cycle again identified in marine and ice-core records. These findings confirm that past climate in the Lake Baikal Region has responded to both global changes relating to the Earth's orbit, and to changes in the Earth's ice cover, despite the continentiality of its location. These changes not only manifest themselves on biological acitivity in the lake, but have also had direct influences on lake-water levels which have risen and fallen in the past by hundreds of metres (Romashkin and Williams, 1997). For example, Arkhipov (1989) details a large fall in lake level during a glacial period, approximately 290-310 Ka BP. A further two recent Siberian glaciations (the Zyryanka glaciation between 110-50 Ka BP, and the Sartan glaciation between 26-11 Ka BP; see Table 2.1) also influenced the Lake Baikal Region (Arkhipov, 1984). The interglacial period between these two cold periods (50-26 Ka BP) has been termed the Kargnisky interstadial. All these stages can be linked to marine oxygen isotope periods 2, 4, and 3 respectively (Julius et al., 1997). 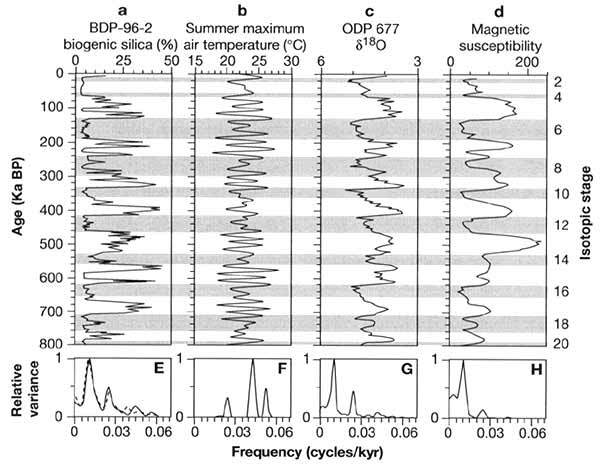 The most recent late glacial period around Baikal is characterized by periglacial conditions, which are again associated with sediments low in biogenic silica (Qui et al., 1993). The appearance of pollen taxa in the sediments are characteristic of steppe vegetation, which in the early Holocene are succeeded by conifers indicative of warmer conditions (Bezrukova etal., 1991; Bradbury et al., 1994). Karabanov et al. (1998) suggest that the Holocene climatic optimum for Lake Baikal occurred later than Eurasia, at 2.5-4.5 Ka BP, instead of 4.6-6.0 Ka BP, and is characterized by high concentrations of diatoms and chrysophyte cysts. Khotinsky (1984) documented colder climatic conditions more recently between AD 1600 and 1850 in Siberia, coinciding with the Little Ice Age (LIA) in northern Europe. Evidence of colder climates during this time is also reflected in changing sedimentary diatom assemblages (Edlund et al., 1995; Mackay et al., 1998 and Bangs et al., 2000). Further changes in diatom assemblages are evident after 1850 as climates became warmer (Mackay et al., 1998). The relationships between the endemic diatoms of Baikal and climate have been explored more fully using multivariate techniques by Mackay et al. (2000) who have found that the dominant planktonic species respond to the physical and biotic environment of Baikal, such as temperature, rather than nutrient availability. Initial results based on diatom-inference models constructed as predictors of climatic variables show promise, and confirm earlier findings by Mackay et al. (1998) that diatom assemblages have responded to recent changes in climate such as the LIA (Mackay et al., 2000).